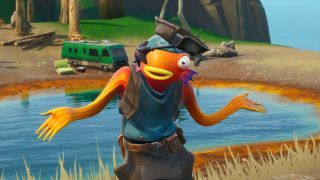 Fortnite's v8.30 update has supposedly been datamined, resulting in discovery of two new items. While we clearly have no way of knowing how—or if—these items will be implemented into the battle royale, we do at least have some information, though it's worth taking these leaks with a pinch of salt. Even if the files are present, they might not end up getting used in an update. Shadow Bombs, uncovered by Skin Tracker, reportedly have a connection with Challenges as well as a string with "Use a Shadow Bomb in different matches" attached to it. You can also check out a couple of related audio files that were shared by Fortnite News, one of which sounds remarkably Kevin-the-Cube-esque. The second item, a Zebulon Drone, was uncovered by Lucas7yoshi_ and is far more obscure. With no audio file to guide us and nothing other than a string that apparently 'starts' the drone, we can only guess what it could be and what it might be used for in-game.